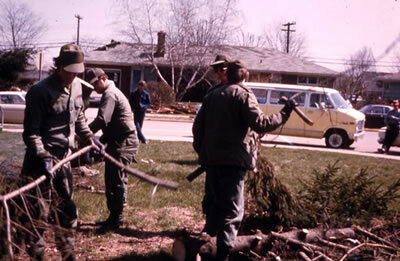 Ohio National Guardsmen at work clearing debris in Xenia after the 1974 tornado. On April 3, 1974, an F5 category tornado struck Xenia, Ohio. The tornado that struck Xenia was just one of at least 148 tornados that occurred in the South and Midwest in a twenty-four period. This was the worst outbreak of tornados recorded in the twentieth century. The tornado that struck Xenia had maximum winds of three hundred miles per hour. It destroyed more than one thousand homes and businesses. Hardly any buildings remained standing in Xenia's downtown. Thirty-three people died in the storm, with approximately another 1,150 people injured. President Richard Nixon visited Xenia a week following the tornado. He stated, "It's the worst disaster I've ever seen." Amazingly, Xenia rebuilt quickly. By April 3, 1975, eighty percent of the destroyed homes and forty percent of the businesses had been rebuilt. It would take until 1984 for all structures to be repaired or rebuilt, but as bumper stickers that appeared within days of the tornado stated, "Xenia Lives!"